Hydroponically grown Bibb lettuce, also known as Boston lettuce or Butterhead lettuce, has a smooth buttery flavor with a hint of sweetness. Our Bibb lettuce has a gorgeous deep green color and tender leaves. Each head of Bibb lettuce is typically small, loosely formed, and velvety soft to the touch. Since our Bibb lettuce is grown using hydroponic methods, it needs less preparation and comes with the roots still attached, so every head of Bibb lettuce you purchase will stay crisp and fresh for longer. All of our sustainably grown hydroponics are available throughout the year, including Bibb lettuce. We offer Bibb lettuce by the case, with a dozen heads carefully harvested for maximum flavor and the buttery texture your clients and customers expect. 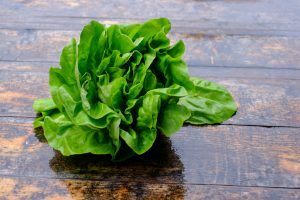 Bibb lettuce shines as the base for a salad or wrap. Bibb lettuce’s buttery texture and slight sweetness make it perfect for using with bold savory ingredients and vibrant fruity flavors. Common pairings for Bibb lettuce include tomatoes (like our heirloom beefsteak tomatoes and heirloom cherry tomatoes), citrus fruits, radishes, fresh or aged cheeses, and herbs like cilantro and basil. Since Bibb lettuce is so delicate, we use a gentle light touch when harvesting to avoid bruising the leaves. Once delivered to your restaurant or produce distribution company, it can be used right away, stored whole, or washed and separated before refrigerating. Baywater Farms is committed to high-quality hydroponic produce grown with care on our sixth-generation family farm. We harvest and care for all of our crops by hand in our ½ acre greenhouse. Since our greenhouse is climate-controlled and carefully tended to, our hydroponically-grown Bibb lettuces, herbs, and microgreens are available throughout the year. All of our sustainably grown hydroponics, including Bibb lettuce, are constantly being grown and harvested, so they can go from our farm to your table in hours, not weeks. You can find our fresh hydroponic Bibb lettuce, cultivated using sustainable growing methods, in national grocery store chains, produce distribution companies, roadside farm stands, CSAs, and farmers’ markets. When harvesting our hydroponic Bibb lettuce, we store it immediately in walk-in coolers to ensure a crisp product. We load our Bibb lettuce into refrigerated trucks so that it stays cold from the moment it is picked until it lands in your walk-in cooler. To learn more about our innovative cold-chain process and ordering our fresh local produce, click here. Our delicious Bibb lettuce speaks for itself, and we know your taste buds will love to listen! Baywater Farms is a sixth-generation family-owned and operated farm servicing Baltimore, Washington, D.C., Hyattsville, Salisbury, Maryland, Delaware beaches, and the Eastern Shore. Baywater Farms is capable of meeting the demands of your produce distributor, restaurant produce supplier, CSA produce supplier, or wholesale produce supplier while maintaining the integrity and character of a small farm. Baywater Farms is about more than just hydroponic lettuce—we also grow heirloom beefsteak tomatoes, shishito peppers, hydroponic custom-blended spring mix, custom grows, colorful radish mix, Maryland’s own fish peppers, and more. When you work with Baywater Farms, you work with an experienced, ethical, and local farm dedicated to providing the highest-quality heirloom produce possible.